This tutorial will guide you to extend system partition when it is running out of disk space on Windows Server 2003 R2. Download IM-Magic Partition Resizer Server to extend system partition size on Windows Server 2003 R2 to fix low disk space problem. It is a headache when receiving low disk space warning on system partition on Windows Server 2003 R2, because most people don't know how to solve the problem. If you know the solution for low disk space on system partition, you will no longer feel upset when receiving such kind of message. Now, you don't need to worry anymore, because IM-Magic Partition Resizer Server enables you to increase the size of system partition on Windows Servers as long as there is free space on the same hard disk. if you don’t have free space, you can merge two partitions in server 2003 to extend the c drive. How to Extend System Partition Windows Server 2003 R2? Download, install and launch IM-Magic Partition Resizer Server. 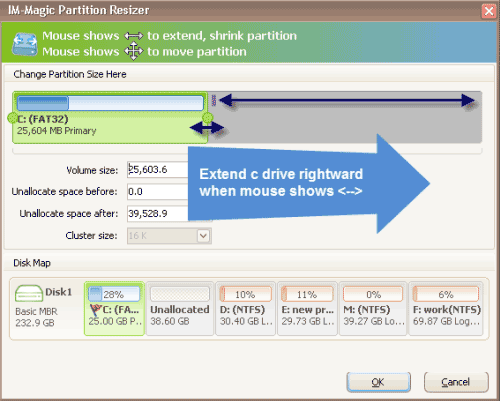 Right click a partition that has large free space and choose "Resize/Move" option. When mouse shows double arrows, you can shrink the selected partition to squeeze some unallocated space. Move the unallocated space close to system partition. Right click system partition and choose "Resize/Move" option. When mouse shows double arrows, you can increase the size of system partition and click "Apply" button. "The system partition on my computer running Windows Server 2003 R2 OS is too small to install any new program, so I decide to extend the system partition. I have tried Diskpart command to extend the system partition, but system says that the selected volume cannot be extended. I also tried some partition software, but some of them ask me to reinstall system in order to get system partition extended. I don’t want to wipe any data, reinstall system or repartition hard disk. I just want to increase the size of system partition on Windows Server 2003 with a simple yet useful method. Can you give me some advice?" Partition software is the only best choice for system partition resizing on Windows Server 2003 R2, because Windows built-in partition utility often has limitations. IM-Magic Partition Resizer Server allows you to extend system partition and data partition on all Windows Servers including Windows Server 2003 R2 with no limitation. You are able to extend system partition without deleting or moving any data by using IM-Magic Partition Resizer Server. Of course, you don’t need to reinstall system or repartition hard disk, either. You can extend system partition on your Windows Server 2003 R2 operating system effectively and efficiently. Whether you run Diskpart command or IM-Magic Partition Resizer Server to extend a partition, unallocated space is needed. Unallocated space refers to the space on the hard disk is not allocated to any partition. Usually, as long as there is free space on a partition, you can shrink the partition to squeeze some unallocated space. In this situation, the unallocated space will be located behind the partition you shrink. 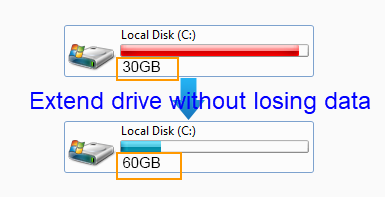 For instance, if you shrink D drive to squeeze some unallocated space, the unallocated space will be located behind D drive. If you want to add the unallocated space to extend C drive, you still need to move the unallocated space close to C drive. As you know, a disk partition on Windows Server can be in NTFS file system or FAT32 file system. Diskpart command on Windows Server 2003 R2 enables you to extend NTFS partition when there is unallocated space right adjacent to the partition you want to extend. However, Diskpart command is unable to extend system partition. Therefore, even if the system partition is NTFS file system, you cannot rely on Diskpart command to extend a system partition. Instead, you can only rely on partition software like IM-Magic Partition Resizer Server to extend the system partition. No matter it is data volume or system partition, Diskpart command is unable to extend an FAT32 partition. Therefore, IM-Magic Partition Resizer Server is the only choice for you to extend an FAT32 system partition. During the partition resizing, all operations will be display on the software, you can undo each operation before you apply the pending changes. Once you click "Apply" button to apply all pending changes, the partition software can accomplish the partition resizing efficiently without rebooting your computer.